You know that moment when you think you’ve invented/discovered something? Quickly, words, imagines and thoughts flash through your mind and you confirm “I’ve never seen this before!”. You’re excited, you think you’re onto something and then you quickly do a Google search. Your heart plops on the floor and you realize there are approximately 9,500,000 results for “Candied Cucumbers”. You’re disappointed and the dream of your book deal and cooking show all about Cucumbers on the Food Network dissipate. But I digress. Summer Fest is here and this week is graced by, you guessed it, Cucumbers! Join in the fun by following the Twitter hashtag #cookingwith and sharing with us your favorite ways to eat cucumbers! Here, I decided to showcase two main ingredients: Cucumbers and Hibiscus. Because as you know, Hibiscus makes everything sexier. In small sauce pan, stir water and sugar together and simmer until all the sugar dissolves. While the syrup simmers, thinly slice cucumbers and drop into the syrup, as well as dried hibiscus. Remove cucumbers from syrup and place on silicone baking sheet. Dehydrate in low temperature oven or dehydrator until they become smooth to the touch. Reserve hibiscus flavored syrup for future cocktail making or as sweetener for lemonade. Drop into vodka tonics as garnish. Set out small plates of it with chic toothpicks and serve as a bar snack sprinkled with salt flakes and red pepper flakes. Add to your water to improve flavor and beat the heat! Hydration can also be flavor packed! Juice half a pineapple, a few celery stalks and 1/4 cup of hibiscus candied cucumbers; a refreshing summer drink! Need more Cucumber Inspiration? Check out these links from the Summer Fest! How can we Sell WOW Gold through the internet? We must make it safe and trust those people who buy our’s products, and we can Sell Gold of other games. What a great idea! This sounds so tasty! Never heard of it either, but your version sounds terrific! Thanks for the “how to use” tips, too, and also for the links. I’ve never heard of candied cucumbers before…it sounds intriguing. And with the hibiscus…gorgeous and exotic and summery too. Well it’s the first time I’ve ever seen it! Awesome idea. What a beautiful photo and tasty recipe! Oh and I feel the same way about creating recipes… when I think I have a new, creative idea to only to find out it has been done before! Just so you know, I’d watch you on TV! I adore cucumbers and can’t wait for them to be ready in the garden. I can honestly say I have never even had the thought of a candied cucumber but am intrigued by the notion! They look beautiful too by the way! I have never heard of candied cucumbers either! Love it! wow! what a beautiful picture dear! and a lovely recipe (as always)!!! You are a creative culinary genius! 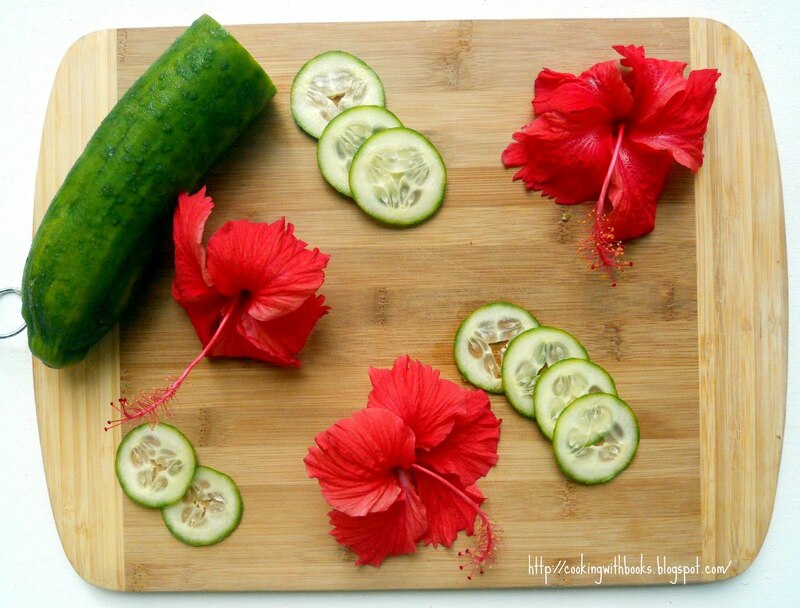 I would never have imagined candied cucumbers, let alone with hibiscus! I like your idea for the pineapple, celery and candied cucumbers! Love the idea. Go nelly go! This one has become a must try. Never heard of candied cucumbers so you still got the Food Nerwork or Cooking channel show as far as I am concerned! & whoah gazzilion results for that search?! Lookin’ good!! How yum is this?? I would be proud to make these and say you invented it. I’ve never heard of it before. Maybe those other people lied. Nice recipe Marnley – good idea and nicely presented. You amaze me! Love it! Totally new and lovely idea..have many Hibiscus plants in my garden..will be doing it soon. What a different and interesting recipe. I would love to drink water flavored with the cucumbers, great idea! What a fun thing to do with the common cucumber! candied cukes just sound hot. i’ve never heard of it before (if that makes u feel better)! What a lovely post & pics! We call Hibiscus the “Gumamela” in the Philippines. This is such a unique way to present it. Thanks for sharing!